The Harmony Greene Townhome Apartments achieved LEED for Homes Gold certification from the US Green Building Council, and is the first project in Pooler to achieve LEED certification. Trident Sustainability Group served as the LEED consultant for the project. Trident Sustainability Group is proud to be a sponsor of the Metropolitan Rotary Roastary Oyster Roast on February 23rd. The event is behing held to raise funds for the West Broad Street YMCA’s youth soccer program, of which Trident is also a sponsor of. For more informatuion or to buy tickets, visit www.metropolitansavannahrotary.org. Trident Sustainability Group announces a new LEED certification – Mercer University Admissions and Welcome Center in Macon, GA.
Trident Sustainability Group announces a new LEED certification – Stephen’s County High School in Toccoa, GA.
Trident Sustainability Group announces new LEED certifications – Clarendon Hospital Addition in Manning, SC. Trident Sustainability Group announces new LEED certifications – Sustainable Fellwood Phases 2 and 3 in Savannah, GA. Sustainable Fellwood Phase 2 includes 8 multifamily buildings comprising 110 apartments, which all received LEED for Homes Gold certification. Phase 3, a 100 unit senior building, received LEED for Homes Platinum certification from the US Green Building Council. Sustainable Fellwood Phase 3 is only the second LEED Platinum building in Savannah, and one of only a handful of Platinum affordable housing projects nationwide. Trident Sustainability Group served as the LEED consultant on these projects, which were developed by The Woda Group and Parallel Housing. Sustainable Fellwood is a 27-acre redevelopment project and continues to set the bar for green affordable housing. Phase 2 includes spray foam insulation, 16 SEER variable speed HVAC units, and low flow plumbing, while Phase 3 features many of the same green strategies but also hosts a 85 KW solar array on the roof – one of the largest in the region. Phase 1 of the project received LEED for Homes Gold certification in 2009 as well as LEED for Neighborhood Development Silver certification. 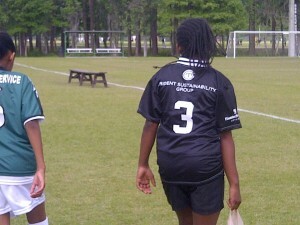 Trident Sustainability Group was proud to sponsor the soccer programs at the West Broad YMCA for their 2012 season. The program had a very successful season with five teams in different age groups. The only other season in which the West Broad Y participated, no team won a single game. This year they had many wins with some of the older teams going to the playoffs. It was great to see the kids improve over the season and love the game more and more. From the first moment the teams were presented with the jerseys, the kids were ecstatic and ready to get on the fields and play! Trident Sustainability Group announces a new LEED certification – Penn Jersey Headquarters and Distribution Center in Philadelphia, PA.
Journeyman Austin/Hutchinson Hotel Holdings, the designated developer for the Trade Center Hotel, announces that Tommy Linstroth of Trident Sustainability Group will serve as a LEED consultant on the proposed convention center hotel on Hutchinson Island.